It’s always fun to add a little seasonal spirit into your center activities. When you download this file you’ll receive 13 winter-themed hands on activities designed to teach number concepts and basic addition. These activities are ideal for use during small group instruction or as independent math center activities. Laminate the games and use them over and over again! Play Doh Mats: Play Doh mats for the numbers 1-10 are included. Students form the number with the Play Doh and then provides the corresponding Play Doh number balls within the 10-frame. 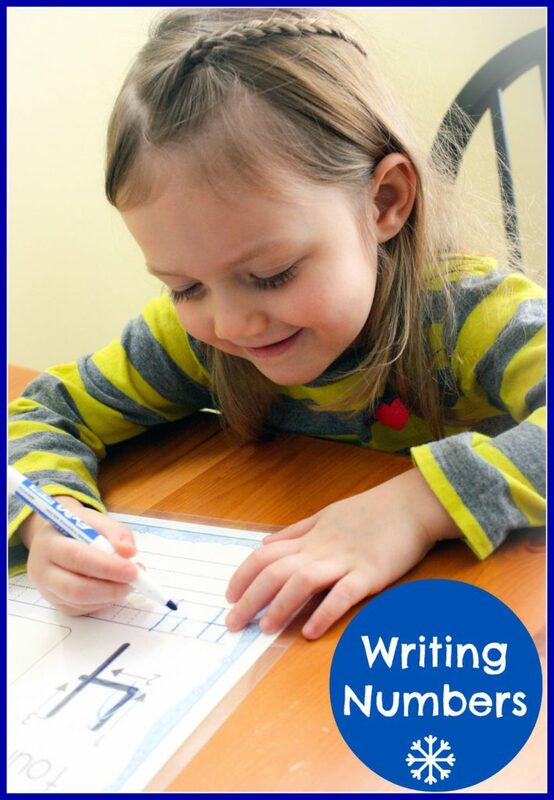 Handwriting Mats (1-10): Number formation handwriting mats for the the numbers 1-10 are provided. Each mat has the correct formation prompt, a line for tracing the number and then a line for independent writing. Handwriting/Missing Number (1-20): Four differentiated 1-20 missing number mats are included. Students write the missing numbers with the dry erase markers. Wipe clean and use over and over again! Handwriting/Missing Number (1-100): Three differentiated 1-100 missing number mats are provided. Students write the missing numbers with the dry erase markers. Missing Number Cards 1-10: Students fill in the missing numbers on the cards with numbers 1-10. Number Order Penguins: Students just love these colorful penguins. This activity is designed for number order 1-20. Race to the Top: This popular activity develops number concepts and correct number formation to 6. Number Cards: Numeral, ten-frame, and number cards are provided for matching activities. How Many? : Students count the number of winter-themed objects on the cards and then writes the correct number using a dry erase marker. Snowball Fight: Students practice addition facts to 10 with the Snowball Fight game. The player to cover all the snowballs on their game board first wins the game! This activity is great for independent math centers. Race to the Igloo: The Race to the Igloo activity works with addition facts to 12. Students roll 2 dice, adds the numbers and moves the corresponding number of spaces on the game board. The first player to the igloo wins the game. Mitten Match: Using clothespins, students clip the addition facts to the answers. Just a fun way of practicing addition facts to 10. Snowball Addition: Another fun game for practicing addition facts to 12. The first player to remove all their snowballs from their pile wins the game!